Having visited many cemeteries, memorials and churchyards in the time I have been researching the regiment, I have many hundreds of photographs of gravestones and memorials. The table here shows which ones I have formatted and are available as jpegs and more will follow as time permits. I would like to acknowledge Chris Collier, who has provided me with close to 100 of the graves (with more to follow I am told! ), mainly from the Bedfordshire area. 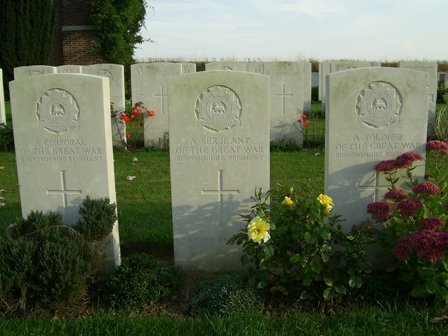 Also, Michael Robson and Ralph McLean (of the South African War Graves project) have photographed and forwarded many of the Bedfordshire and Hertfordshire men's graves from the Middle East and North Africa, which are naturally harder to get hold of, so may be of use to someone. If you would like a copy of one of them, please get in touch with me and I will forward the photo. They are all in jpeg format and vary in size, depending on what equipment was at the time! If you have additional photographs that you would like to make available to others from this site, please contact me and I will build them into the database with pleasure. As well as the photographs, if you have catalogued them already, I would greatly appreciate the index as well of course, preferably in an Excel spreadsheet format if available. If they are not catalogued, not to worry as just having them available would be great! As with all the info on this site, there is no charge for it as my wish is to make the information available to those who need it but cannot get to it. If however you feel you have benefited from it being here (and can afford to of course), all small donations are gratefully received and help towards the expansion and continuing development of the site. If the grave you want is not in the table, try The War Graves Photographic Project. 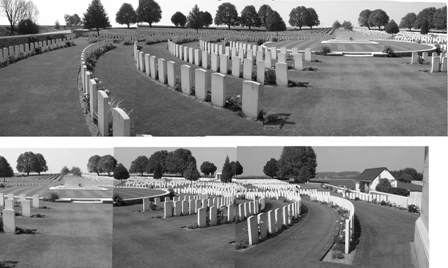 It is a major collaborative project with the Commonwealth War Graves Commission (CWGC) to photograph all CWGC graves and make them available to those who want them. There is a charge for this service but I am told the response is superb (although I have not personally used them, so cannot claim to know either way!) and the quality is worth the cost. If you would like to see where a relative is buried but are unable to visit the cemetery, this site will be of interest. Giving 360 degree views of the cemeteries, it captures the essence of them more than still photography can. Pozieres is the featured cemetery in the link but have a look around for others. There is also a War Memorial section on this site, with a selection of local and international memorials, as well as some links to external sites both nationally and internationally. See the links section at the base of the page for quick links.